I was just getting around to writing about the dismal weather today when the sun started peeking through the broken clouds and fog. 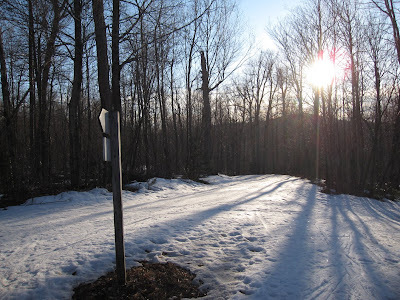 I was winding up for a big whine; the snow is gone and I had my last day of cross-country skiing at Mount Van Hoevenberg until next November, I guess I'll set up the bike trainer, morning porch time featured 36 degrees and drizzle, waaah. I was then going to rave about an incredible sunset ski I had Wednesday evening at MVH, so I will. There are good ski days and then there are days when it would be an insult to nature to not get outside and ski. This past Wednesday was one of those days. The night before was below freezing, but not -7, and the day was warm and sunny. My friends the back-country, and perhaps crazier skiers, skied slides and are still alive to tell about the great day. Reports from Whiteface were glowing and my ski at MVH was one for the memory bank. I ended up catching corn snow redux on the cross-country trails because I went out so late in the afternoon. I love this time change! The snow had already thawed earlier in the day and was just starting to refreeze. Conditions were very fast; tuck and go fast, but turns were easy and fun. I am sorry to say it is all gone now, but if you plan now, perhaps you can try it next year. Granted, this would be the time to lament the end of ski season, but now even more sun is out and we've got that Adirondack color scheme going, the air smells so fresh, and steepandcheap is featuring more summer clothes! I wonder how I can get outside on the road bike earlier this year...I guess it's not that bad.